For more tips on creating with the Blossoms collection, watch the tutorial at https://youtu.be/swO34-n1HNc. For the magnets this video has some helpful hints: Album & inserts, watch the tutorial at https://youtu.be/uThSFbPtnYE. Instructions: Click here to view more photos of this project. Card size: 6" x 6" x 1". Start by making the cover for the Accordion "Book"- Cut 1 piece of tan card stock 7 1/2 x 6" and 1 piece 9 x 6" tan. Score 7 1/2" piece at 6" and 7" leaving 1/2" as a glue tab. Score the 9" piece at 6"and 7" leaving a 2" end. Glue the 1/2" tab to the inside of the 6" part of the second piece. Glue one half of magnet set to the 2" piece on the outside and Tape to let glue set. Place the other magnet half on top of taped magnet and put some glue on the top of it, then close cover, open it again and use the spot of glue left behind as the place to glue the second magnet half after lifting off first half. Tape glued magnet half and allow both to dry. Cut decorative paper for each cover panel leaving a 1/8" border of tan. Make accordion pages with 2 pieces of tan card stock 11" x 5 5/8". Cut one piece of tan card stock 1" x 5 5/8" then score and fold in half to glue page sections together. Score both 11 x 5 5/8" pieces at 5 1/2" and glue the two together using the 1" folded tab. Cut Decorative paper to cover each side of each page. Die cut "scene" square, using the Cut Mat Create 2A, from the front cover panel then cut a piece of Fun Foam the same size square to fit. Glue the squares together. Glue all decorative paper pieces onto cover and pages including the front, replacing the now popped up square in the center square opening. Tabs will be covered and so will the magnets. Stamp, die cut and color 1 set of deer, 2 sets of bunnies, 1 set of squirrels, 2 sets of cardinals, misc. small blossoms from Wildwood, Rain boots and Blossoms, coneflowers, the large Coneflower corner, tall Coneflower, birds on umbrella (Songs of Spring), and the Just for You banner. Cut from tan card stock, 3 Blossom Corners, 3 small Fleur pockets and 2 large Fleur pockets, 1 Ornate Border, 1 border from the Cut Mat Create . 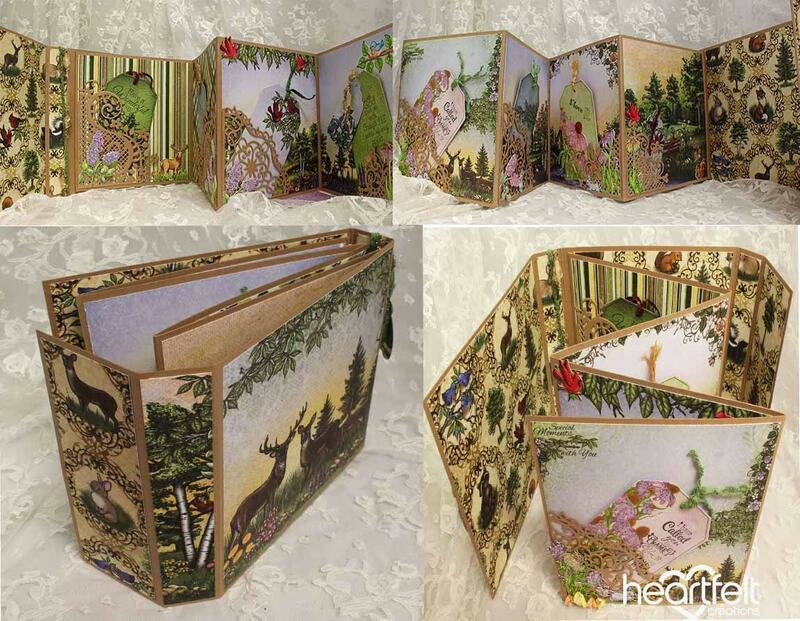 Start with the inside pages, decorate with pockets and blossoms plus wildlife here and there on all pages, both sides. Using the Luggage and Tag die, cut tags for all the pages, stamping with sentiments or leaving blank for writing. Add fiber or ribbon to the top of each tag and insert into pockets. Add fibers to the book binding and then add a small tag on one of the pieces of fiber hanging down the side. This could have your book title if desired. The final part of this project is to decorate the front. The paper including raised center should already be glued down, now glue 2 borders top and bottom of raised center (from Cut Mat Create and Ornate Pockets and Borders). Add all pieces of Coneflower corner and tall Coneflower to go around raised center like a big letter "U". This border is popped up in places. Add the Banner snuggled in one corner and then add the 2 birds from Songs of Spring, 1 on each side at the top. Add glitter to flower petals (I thinned some glue with water and brushed it onto petals then sprinkled with glitter).